This is a true tale of a teenage girl who, in 1983, refused to go to school and became a ward of Quebec’s juvenile system, eventually making her way to The Farm. It questions the use of incarceration as a means of dealing with youth protection cases, and it offers a rare glimpse inside one of Quebec’s oldest juvenile detention centres. The Shawbridge Boys Farm, just north of Montreal Quebec, has been reforming children for more than a hundred years. Thousands of stories can be collected from the children, adults, and seniors who have lived on “The Farm”. This is a story of just one of them, but it can’t be told without including many about the kids who were there with her. A story from one of Canada's oldest juvenile detention centres. This book has taken me years to write, and now that it is done, I sometimes pick it up and find it hard to believe it’s my story. From this vantage point it certainly feels like it happened to someone else in another lifetime. The stories that follow are remembered and re-remembered from decades ago. Time has misted my memories till the edges are no longer sharp, but there are those snapshots, so crystal clear I can still smell the smells, and taste the tastes. I guess those are a big part of why I wanted to write this book in the first place. If I remember them, then others will too. As I went over my own stories in my head, I wondered about all the other Shawbridge kids that have passed through The Farm. Thousands of them, going all the way back to the turn of the century. Where are their stories? I started looking and found nothing. I thought, his can’t be. There are quite possibly eighty-ninety-one-hundred-year-old former Shawbridge clients still living today, but no stories? I went to McGill University in Montreal hoping to read everything I could about Shawbridge. McGill has supplied graduate after graduate to numerous institutions that make up the Quebec juvenile system* with Shawbridge (now Batshaw) being one of its oldest juvenile placements. I was shocked when I could only find a grand total of three books about the one hundred year old institution: two of them in the rare book section printed before 1940, and the third one, I’d already read, Normal Bad Boys, Public Policies, Institutions, and the Politics of Client Recruitment, written by Prue Rains and Eli Teram. How tragic that what happened to us there wasn’t being preserved or documented in any way. I didn’t have a high school graduation class to identify with, so I chose to identify with Shawbridge kids and started calling them, Grads, adding all of us to The Farm alumni. I took interviews of all the grads I could find, and I realized that despite some nail-curling stories, we all had positive stories, too. Many, in fact. We missed it in this strange way. 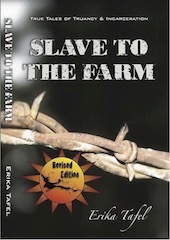 There was this undeniable trauma bonding that had gone on among the people in each unit and all of us on The Farm. I heard more than once about this feeling of community that was present on The Farm and that many grads were still trying to replace as adults. In the end, I came to believe very strongly that it’s important for stories like mine to be told. Not only because it may encourage more like it, but because I wanted to start a dialogue that seems to be missing from the juvenile justice discussion. There are many stories/books/articles about clients/patients/inmates in all kinds of institutions, but these stories are rarely from the client’s point of view. The history most often preserved is by the policy makers, professionals, and industries that benefit from having more and more control over the lives of the people who live in these places. These histories are written by the winners, so to speak, and are lacking in the areas of human experience. I’m hoping my book speaks to that human experience and reminds history that we were PEOPLE in those institutions and not statistics, or blacked out names in documents. This book isn’t warm and fuzzy, but remind yourself that I’m actually one of the lucky ones. I made it through somewhat scarred but I found healing. Some kids aren’t so lucky. Some just graduate to the adult system, pretty much believing they were destined for it all along.